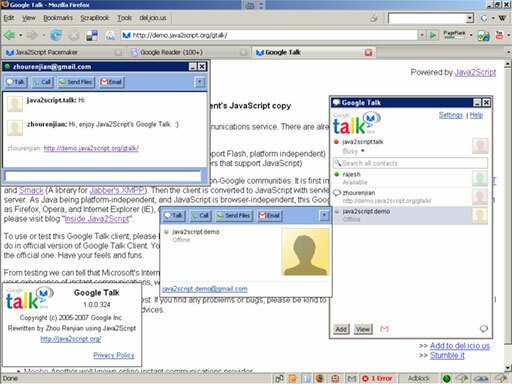 In March, I wrote “Java2Script version of Google Talk”. It was a very simple SWT application that talks to talk.google.com using Jabber XMPP protocol by Smack library. About 3 months later, I rewrote the whole Java2Script version of Google Talk. In this time, I still used Smack library. But I used Instantiations’ Windows Builder Pro to help me to design the whole interface. And this time, it copied all existed UI from the desktop version of Google Talk, including every dialogs, menus or layouts. It looks almost exactly the same of Google Talk. It is just trying to re-implement all the features of Google Talk except the voice talk. And all dialogs or layouts are copied from Google Talk, as I thought that Google Talk is excellent. Java2Script’ Simple RPC and Simple Pipe were used in the Java2Script Google Talk. Simple RPC serializes requests from browser to server, and server will parse them and send out related XMPP requests. All packets received from Jabber server are piped through Simple Pipe to the browser. The Simple Pipe just serializes XMPP packets into SimpleSerializable instances, and sends out through the comet HTTP connection. That is to say, Simple RPC is OutputStream and Simple Pipe is InputStream in Java’s terms. And all data are serialized or deserialized by SimpleSerializable. // begin to later action. Second, some part of codes are executed lazily. For example, create menus may require a lot of CPU times for browser. So only before the menus are to be shown do the menus are being created. In such a way, only what you see on the UI is created. Or they won’t be created by default. Third, virtual list is used to avoid large friends list updating. For example, if there are more than 200 friends on one’s Google Talk friends list and concrete SWT widgets are created according to each friends, there will be 200 widgets being created. And it will freeze the whole browser UI. And when the dialogs are resized, re-layout these hundreds of widgets may also freeze browser. To avoid such freezing, virtual list is introduced. The virtual list is that only visible list item are created. Those invisible items are never created. In such a way, 500+ friends are supported.